Interestingly, unlike the new Canterbury England shirt that we reviewed last week, this jersey combines the Canterbury Loop neckline with a proper fold-down collar. It’s not a completely traditional collar, or course, but it’s still nice to see a modern interpretation of it on a test jersey. Like the England shirt, it also features raised ‘ball deadening’ bumps all over the chest, but unlike the controversial Victoria Crosses used on the England jersey, this one opts for much more straightforward stylised versions of the IRFU badge. It’s equally interesting to note that the shirt doesn’t follow the pattern of the England and Leicester designs by locating the badge in the middle. Given the size of new main sponsor 3, this is a smart move, however, as things would have gotten very crowded otherwise. If you read our review of last year’s Ireland alternate shirt, you’ll have read a fair bit of our grumbling about how Ireland didn’t even need a change shirt last season as they weren’t playing South Africa… well, this year they are, so the shirt is justified, and that’s great, because it’s a beauty! Canterbury says that this shirt is a inspired by the shirt Ireland wore for their first test against England in 1875, where they wore a fetching white and green hooped number. This isn’t hooped, of course, but it does sport some very fetching green horizontal pinstripes, which is similar to the pinstripes seen on the Leicester home shirt this season. Matched with a green collar, it’s a very nice design indeed – classy, understated and yet not in any way boring. 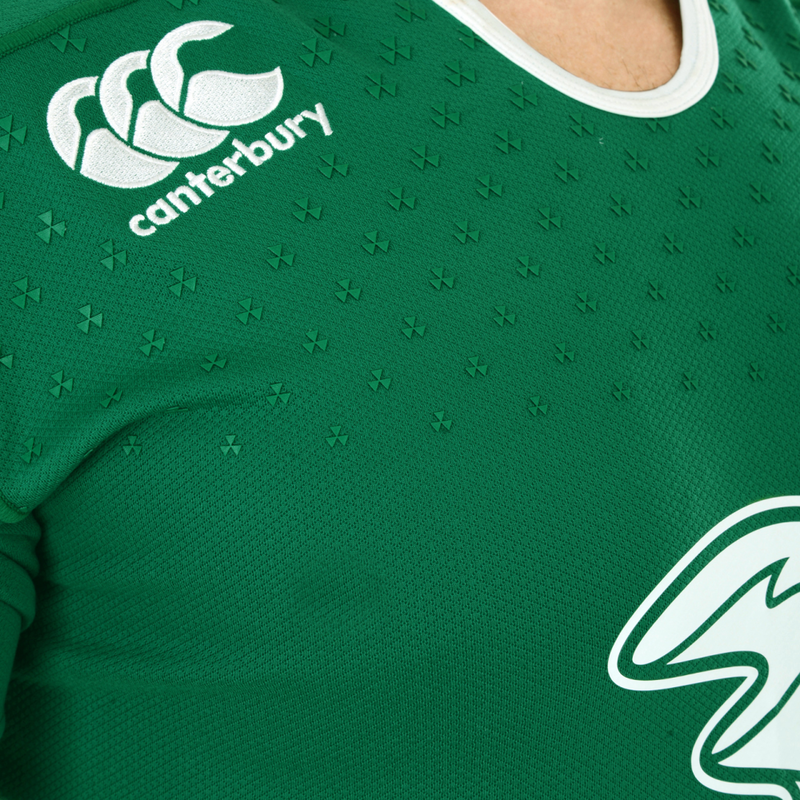 Ireland fans have been getting in touch via Twitter and Facebook for months asking us for any gossip about the new Ireland shirts – clearly the return to Canterbury has stoked plenty of excitement among the green army. It’s good to see that by and large, the reaction has been so positive to the new gear, then, and it’s not hard to see why. Two very classy, classic shirts that hot that sweet spot between retro and modern.